The history of Perugia goes back to the Etruscan period. Perugia was one of the main Etruscan cities. The city is also known as the universities town, with the University of Perugia founded in 1308 (about 34,000 students), the University for Foreigners (5,000 students), and some smaller colleges such the Academy of Fine Arts “Pietro Vannucci” (Italian: Accademia di Belle Arti “Pietro Vannucci”) public athenaeum founded on 1573, the Perugia University Institute of Linguistic Mediation for translators and interpreters, the Music Conservatory of Perugia, founded on 1788, and others Institutes. There are annual festivals and events: the Eurochocolate Festival (October), the Umbria Jazz Festival (July), and the International Journalism Festival (in April). Today, the Galleria Nazionale dell’Umbria in Perugia houses a number of masterpieces, including the Madonna with Child and six Angels, which represents the Renaissance Marian art of Duccio. And the private Art collection of Fondazione Cassa di Risparmio di Perugia has two separate locations. Arranging a private jet charter to and from Perugia San Francesco d’Assisi – Umbria International Airport (LIRZ/PEG) is straightforward. The airport lies 15 kilometres away from the city centre and takes around 30 minutes by car, subject to traffic. A private jet charter from London to Perugia airport will take approximately 2 hours 15 minutes in a 6 seat Cessna Citation CJ2 jet, and 2 hours 05 minutes in a 8 seat Cessna Citation XLS jet. 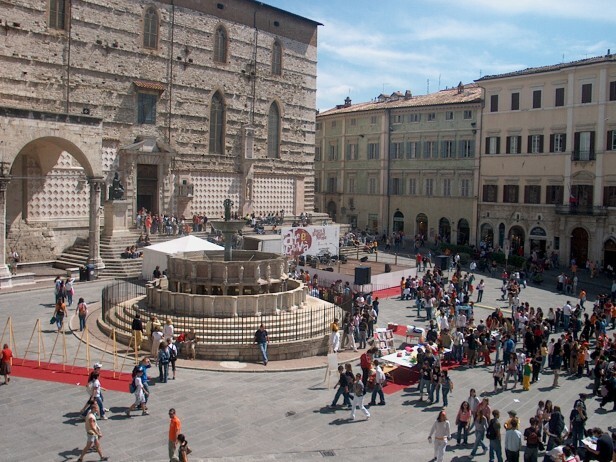 Arranging a private jet charter or helicopter transfer with Freedom Air to arrive in style to Perugia is simple. The Freedom Air team can be reached on +44 (0) 1275 548001 to book your next trip.